Tree Jasmine, Radermachera Elmeri. 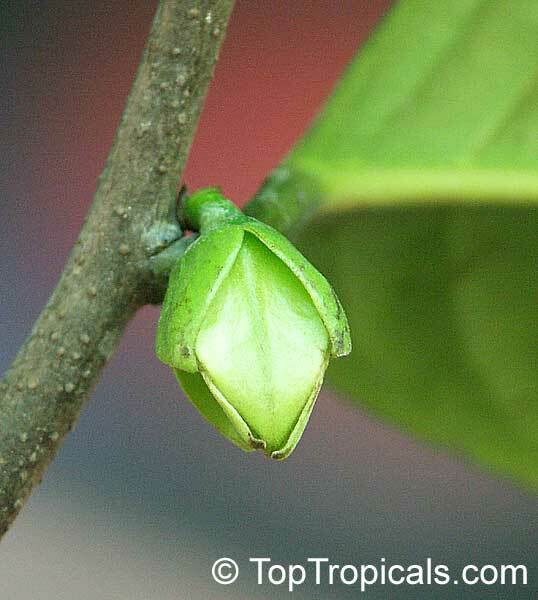 Tropical tree small to medium size, with fragrant tubular flowers, similar to Radermachera Kunming, but bigger, with similar leaf structure; it is more fast growing and vigorous. 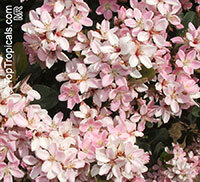 The scent resembles roses, juicy fruit, candies, fine cologne all together and can be smelled from many yards away. 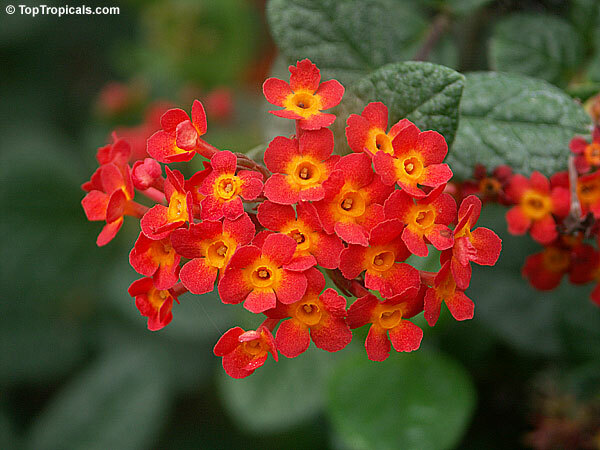 Leaves are very ornamental and have a fountain-like architecture. In Thailand, the tree symbolizes simplicity, endurance, advancement, and peacefulness. Extract from these flowers is used in village pharmacy as relaxant and aphrodisiac. 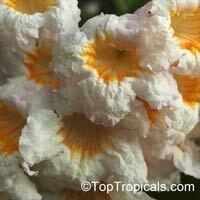 Very pretty apricot colored flower - rare collectable small tree from China. Flowers are slightly fragrant. Tree Jasmine, Peep Thong. A medium to large size tree cultivated in Thailand and very rare in private collections. Leaves are very ornamental and have a fountain-like architecture, the tree looks very pretty even when not in bloom. Bright orange flowers have sweet jasmine-like fragrance. 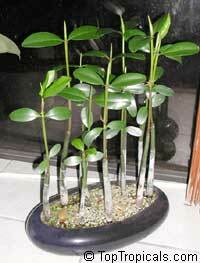 This tree is easy to grow in a pot. The species not as well known as Michelia or Cananga because of its rarity, but it's a real gem of any fragrant plants collection. Requiring little care, the tree grows quickly even in unfavorable soil or climatic conditions. With its beautiful canopy, the tree symbolizes simplicity, endurance, advancement, and peacefulness. This is a provincial tree of Chiang Rai province of Thailand. Dwarf Tree Jasmine. 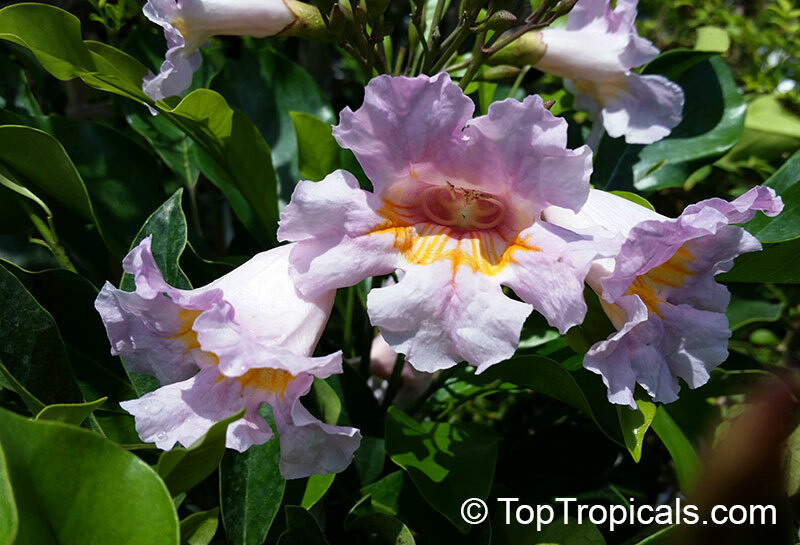 A very rare small Thai tree with extremely fragrant flowers. The scent resembles roses, juicy fruit, candies, fine cologne all together and can be smelled from many yards away. 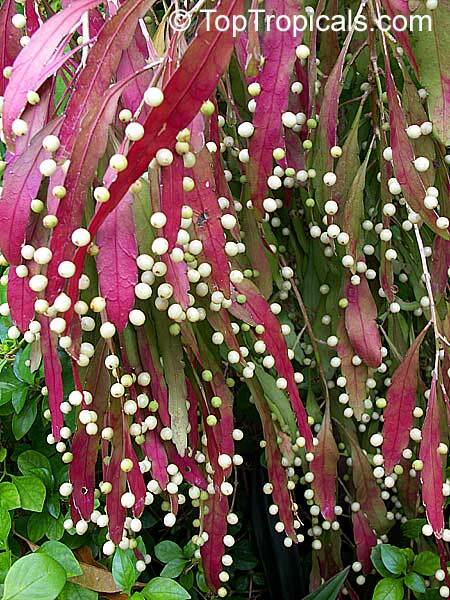 Leaves are very ornamental and have a fountain-like architecture. In Thailand, the tree symbolizes simplicity, endurance, advancement, and peacefulness. 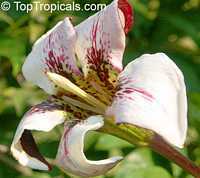 Extract from these flowers is used in village pharmacy as relaxant and aphrodisiac. Blackberry jam fruit, Jasmin de rosa - fragrant white flowers and edible fruit that tastes like blackberry jam! Rare exotic that will fruit in a container. Kids love the fruit! Be Still Tree, Quinine Tree. 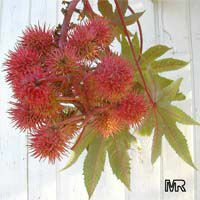 A fine, fast-growing tree for sheltered gardens, easily raised from seed and an unusually decorative tree for larger gardens and parks. The sweetly scented flowers attract butterflies and other insects, which in turn attract insect-eating birds, that bring about pollination. The hydrophilic nature of the plant allows seed dispersal by water to take place. 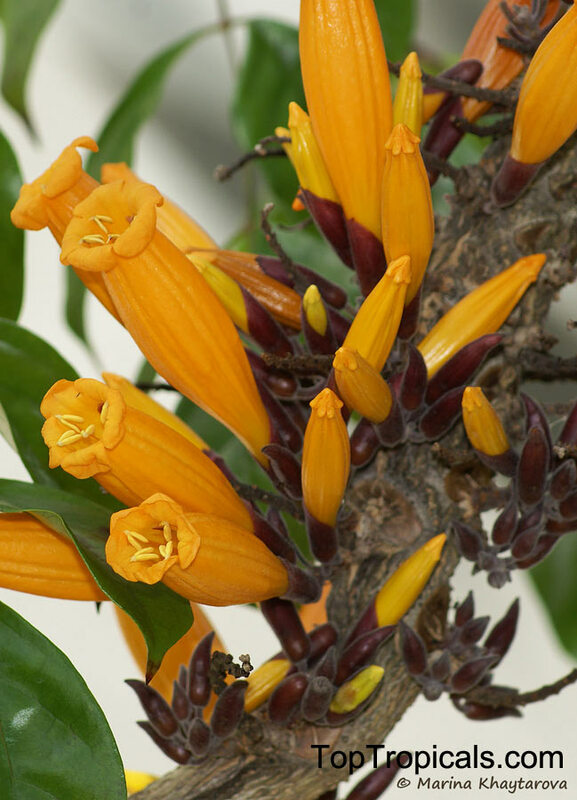 Rauvolfia was named after a medical doctor and a collector of drug plants from the 16th century, Leonhart Rauwolf of Augsburg, and caffra means of Kaffraria (Eastern Cape). The common name quinine tree refers to the bitter and supposedly quinine-like properties of the bark. Melodorum siamensis, Rauwenhoffia. A small tree closely related to Ylang Ylang, with smaller flowers, greenish in color and highly scented. A single flower fills the air around (feet away) with pleasant perfume, thus the plant has a high value and is often used in Asian gardens. The Travelers palm is one of the nature's most distinctive and remarkable plants. Although this plant is called a palm, it is not a true palm. It grows up, to 40' tall, while the big banana-like leaves can grow up to 15" long. 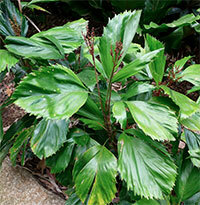 The leaves are arranged in a fan-shaped manner; it has a rather short, palm-like, trunk. The small white flowers are held in bracts. In these bracts and leaf folds, rainwater is collected. The fruits are brown while the seeds are blue. 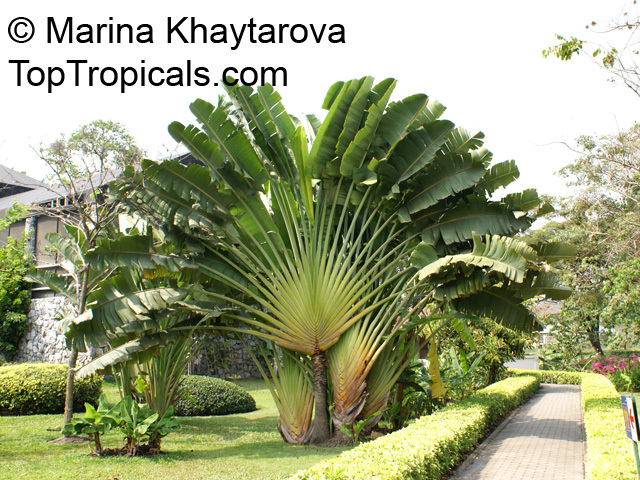 The Travelers palm is one of natures most distinctive and remarkable plants. Although this plant is called a palm, it is not a true palm. It grows up, to 40' tall, while the big banana-like leaves can grow up to 15" long. 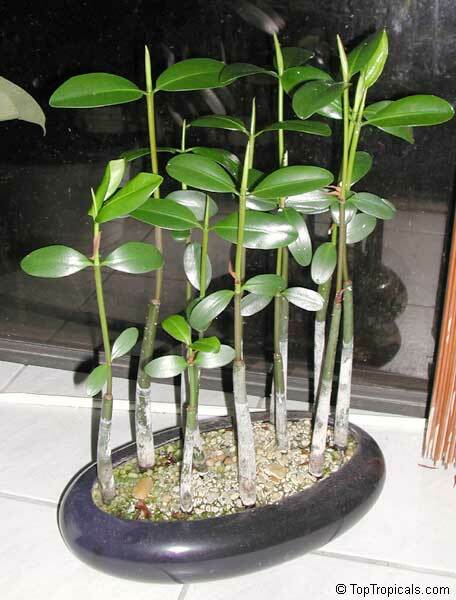 The leaves are arranged in a fan-shaped manner; it has a rather short, palm like, trunk. The small white flowers are held in bracts. In these bracts and leaf folds, rainwater is collected. The fruits are brown while the seeds are blue. Very Rare Window Pane Palm. Makes amazing container and houseplant! Small, clustering palm to only about 3 ft tall! 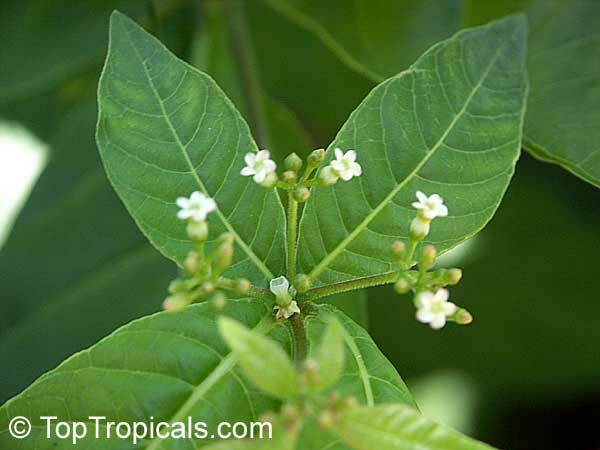 It has small (1 ft long) simple leaves bifid in the apex. However, you can find leaves completely divided at the base, giving the impression of a compound leaf, all are notched or have serrations towards the end of the leaves. Ovoid fruit are beautiful dark purple when mature. Much sought after as a collector's palm and always in short supply, it makes a superb potted specimen. 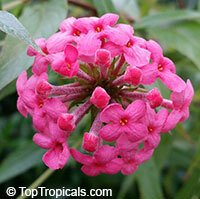 It is well suited for the warm subtropical or tropical garden. 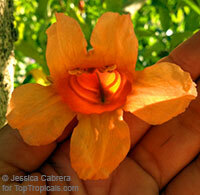 Native to rainforest of Central America, from Honduras thru to Panama. Indian hawthornes are low growing, spreading evergreen shrubs with thick, leathery, serrated, oblong leaves. They are dark green on top and lighter on bottom. Star shaped flowers are held at branch tips in loose clusters and are white or light pink, with five petals, and lightly fragrant. Yellow fruit with a white-translucent pulp having an aromatic, acidic flavor. Related to the mangosteen, the madrono remains a relatively unknown, but attractive fruit. Eaten fresh, but can also be made in to jams and jellies. A small tree, usually only to 5-15ft, but taller in its native range. 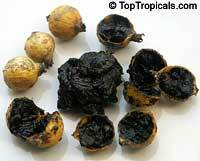 The madrono is much hardier than its famous relative the mangosteen, and can survive short periods of frost. Trees are very salt tolerant. 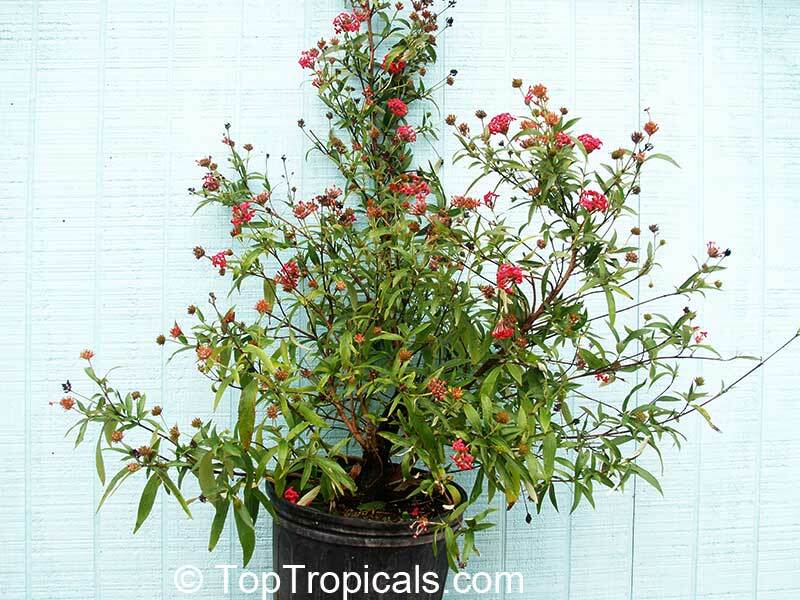 Madronos are slow growers and can be maintained for container culture. 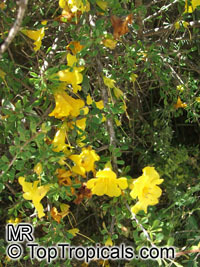 South African erect spiny shrub/small tree from Bignonia family with attractive scented yellow tubular flowers. Native tribes believe that carrying a stick of Rhigozum will bring good luck. 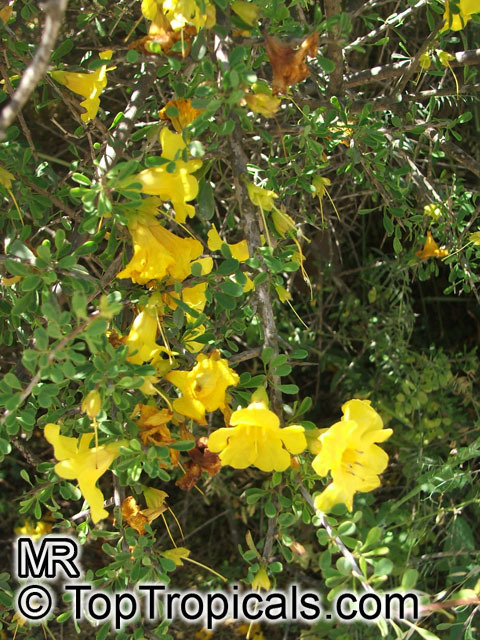 Common names include: Yellow Pomegranate, Western Rhigozum, Short Thorn Pomegranate, Mopane Pomegranate or Mopane Rhigozum or South African Tree Number 676, or Zambezi Gold. Red Rhipsalis. Arched then completely pendant flat tapeworm stems turn deep violet red in high light; tiny flowers followed by ornamental shell berries lining both edges of the ribbon stems most attractively. Rose Myrtle is a flowering plant, native to southern and southeastern Asia, from India, east to southern China, Hong Kong, Taiwan and the Philippines, and south to Malaysia and Sulawesi. 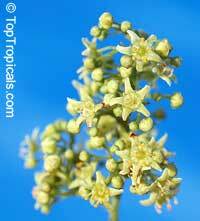 It grows in coasts, natural forest, riparian zones, wetlands, moist and wet forests, bog margins. 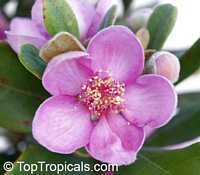 The flowers are solitary or in clusters of two or three, 1-2" in diameter, with five petals which are tinged white outside with purplish-pink or all pink. The fruit is edible, purple, round, soft. Easy to grow! Nana-berry is an attractive shrub up to 15-20 ft tall from South Africa with showy, lovely yellow to orange-red foliage in autumn. 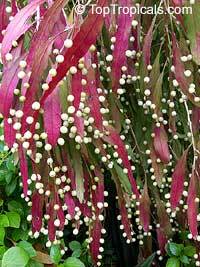 The leaves, which are pink when young, turning dull yellow to orange-red in autumn. 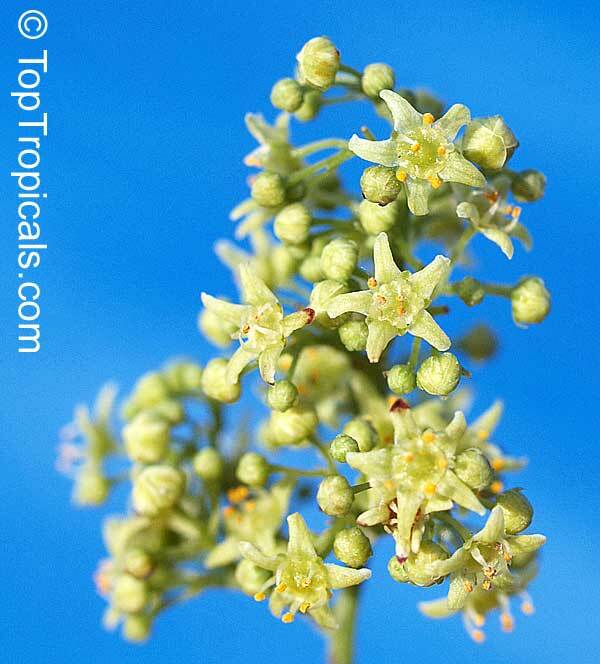 Small, yellowish green flowers are borne in clusters at the end of the branches. This species has male and female flowers on different plants. Sow seed in trays and provide constant warmth to speed up the germination. 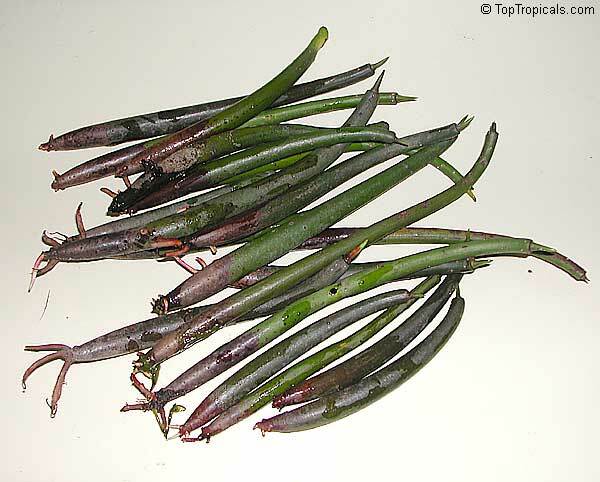 Red Castorbean Castorbean is cultivated for the seeds which yield a fast-drying, non-yellowing oil, used mainly in industry and medicines. The castor oil is extracted from the beans, which is used for medicinal purposes. 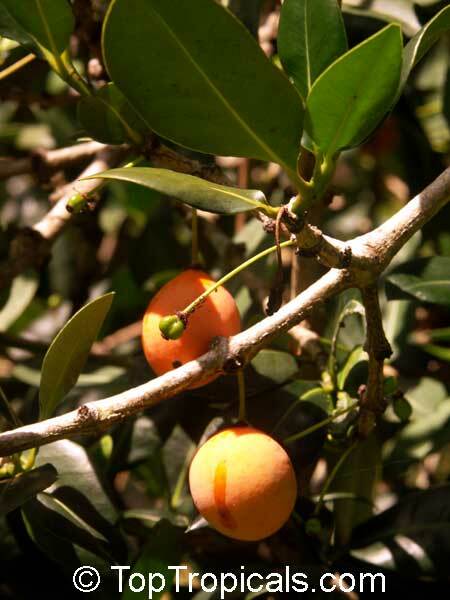 In S. American traditional medicine the juice from the leaves is used against rheumatism, headache, ringworms and warts. Plant seeds in well drained soil, barely cover the seeds and keep only lightly moist, in filtered light. Do not keep wet. Biriba, an exotic fruit from Annona family. Large yellow fruit with a bumpy surface and soft spines. Tastes delicious, and is described as a creamy lemon sherbet or a lemon meringue pie. Small tree. Good for container culture. 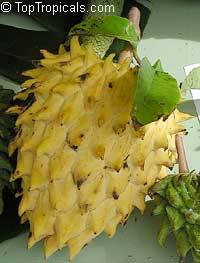 Biriba - Large yellow fruit with a bumpy surface and soft spines. Tastes delicious, and is described as a creamy lemon sherbet or a lemon meringue pie. Plant seeds immediately at a 1" depth using well draining soil mixture with 10% coarse sand added to it to aid drainage. Keep warm at all ties with high humidity. Requires bright light. Panama Rose. Shrub to 5 ft with bright-pink, star-shaped flowers in clusters. The flowers attract butterflies with nectar. The Panama rose has an added bonus for those who sit in the garden in the evening. The flowers are sweetly fragrant, especially after sunset. See picture of the 3 gal plant. Panama Rose - very rare plant, hard to propagate and slow growing. 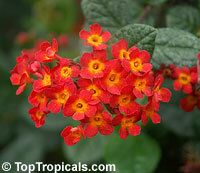 Fragrant reddish orange tubular flowers with yellow throats in summer to fall. This plant is a great butterfly attractor, blooms most of the year, most profusely from spring to fall.